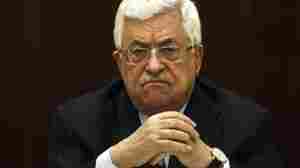 July 26, 2012  A longtime proponent of a peaceful solution to the Arab-Israeli conflict, Palestinian President Mahmoud Abbas is feeling the heat from Palestinians frustrated with the lack of progress in Mideast talks. Opponents also say the 77-year-old leader isn't addressing dire economic problems. July 19, 2012  In Bulgaria Wednesday, seven people were killed in a suspected suicide bombing in the seaside resort of Burgos. Five of the victims were Israelis. Israel is calling it a terrorist attack, and says it suspects Iran or Muslim extremists. July 17, 2012  Israel's ruling coalition collapsed Tuesday as the Kadima Party withdrew from the government in a dispute over extending the military draft to members of ultra-orthodox community. The move by Kadima is expected to lead to early elections, perhaps next January. July 16, 2012  Secretary of State Clinton is meeting with Israeli leaders in Jerusalem Monday. U.S. relations with Israel have focused less on the Palestinian situation, and more on the chances of a war against Iran. 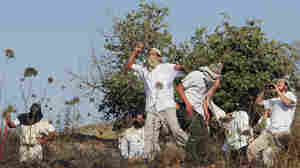 July 12, 2012  Israeli-Palestinian violence has been at a comparatively low level in recent years. 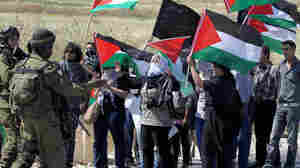 But violence by Jewish settlers against West Bank Palestinians is up sharply, according to the report by U.N. agencies and Israeli and Palestinian human rights groups. July 12, 2012  Republicans are canvassing for votes in Israel. There are 150-thousand eligible voters living in the Jewish state. And unlike their U.S. based cousins, American Jews living in Israel are overwhelmingly Republican — making this fertile ground. July 10, 2012  Israel's razing of homes in the West Bank and east Jerusalem left 1,100 Palestinians homeless last year. Israelis say the homes were built without the proper permits. Palestinians say their applications are almost always rejected because Israel wants them to leave these areas. July 9, 2012  The Israeli government may extend mandatory conscription to include the previously exempt ultra-Orthodox Jews and Arab citizens of Israel. 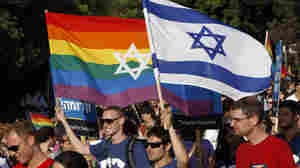 But Arab Israelis, who say they are treated as second-class citizens, are furious about the proposed change, which many say is a loyalty test. July 4, 2012  Since 2005, medical marijuana use in Israel has grown from a few hundred government-licensed users to more than 10,000. The demand for cannabis, prescribed to treat ailments such as cancer and chronic pain, has created a smoking new market. But the new venture is not without its critics. June 26, 2012  Arab and Jewish families have shared the Israeli village of Neve Shalom for decades, despite violence in surrounding areas. But a recent episode of vandalism has shown that not even this oasis is immune from Middle East strife. June 25, 2012  Russian President Vladimir Putin is making a rare visit to Israel, with an entourage of some 300 officials and businessmen. The war in Syria and Iran's suspect nuclear program will figure prominently in Putin's talks with Prime Minister Netanyahu and other Israeli officials. June 6, 2012  A bill to legalize Israeli settlements built on privately-owned Palestinian land in the occupied West Bank was narrowly defeated on Wednesday. The vote could have repercussions for Prime Minister Benjamin Netanyahu. The prime minister opposed the bill but many of his coalition partners, including cabinet ministers, voted for it. May 18, 2012  For decades, the Palestinians have urged foreign Muslims to boycott one of the holiest sites in Islam, the Al-Aqsa mosque in Jerusalem. But now, Palestinian religious figures are encouraging such visits, saying they could highlight Palestinian claims in their feud with Israel. May 17, 2012  Palestinian prisoners ended a mass hunger strike aimed at improving conditions in Israeli prisons after reaching a deal with Israeli authorities this week. The success has some Palestinians calling for a greater emphasis on nonviolence in their opposition to Israeli policies.